7 days a week, 12 p.m. - 9 p.m. Whether you’ve worked up an appetite kiteboarding on site or you just want a meal with a water view, Good Winds is a good choice on northern Hatteras Island. With its second-floor perch over the Pamlico Sound and a deck for outdoor dining, it’s the place to watch the sunset. The menu features familiar local seafood — tuna, grouper, scallops, shrimp, crab cakes, fresh catch of the day — along with some more exotic offerings like house-cured bacon. And you can choose from appetizers, sandwiches, burgers, fish tacos, salads, seafood entrees, pasta, noodle bowls, chicken and ribs. Everything is chef-prepared and made from scratch. A kids’ menu is available. The bar has one of the most extensive wine and craft beer selections on Hatteras Island as well as a full liquor license, and it’s a good place to hang out after a ride in the wind. 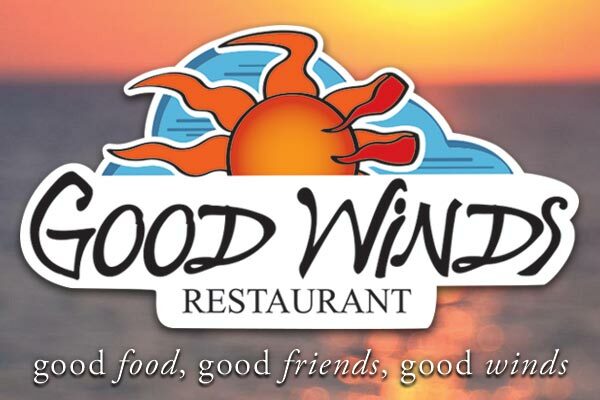 Good Winds is open for lunch and dinner seven days a week in season. The Early Bird deal from 3 to 5 p.m. daily offers 20 percent off all food items except all-you-can-eat specials. There’s an all-you-can-eat fried shrimp special on Tuesdays. On Fridays there’s a fresh fish fry and live music from 6-10 p.m.
For parties of 8 or more, it is recommended that you call and make a reservation before arriving. Waterfront dining at the premier Kiteboarding Resort in North America with live music and outdoor dining in the summertime.